Euan Thorburn and Paul Beaton’s victory on last weekend’s Border Counties Rally makes it three wins on the trot for the Ford Focus WRC crew, and the 2019 season is barely four weeks old. Two victories on the first two rounds of the BTRDA series and this latest on the opening round of the KNC Groundworks Scottish Championship may make it sound rather easy, but that was far from the case. Garry Pearson and Dale Bowen were in the hunt from the start, but ended up second, while Stephen Petch and Michael Wilkinson were actually surprised to find themselves third at the finish! Once again, the Border Counties was all about the weather. Overnight snow blanketed the Borders and it was still snowing as the cars gathered in Jedburgh ahead of the 8.30 am start, but then the falling snow turned to rain. Fears dissipated and hopes rose as the main roads started to turn black once again. Even so the first cars on the road would encounter snow covered stages, and in this case, it was the two wheel drive boys and girls who would venture first into the great unknown. Although declared a ‘Snow Rally’ earlier at 7.40 am by the organisers conditions were visibly changing as the 08.30 am rally start time approached. There was snow on the first two stages, slush on the next two while the final two were just wet and muddy although there was grip to be found. By the time the top 4WD seeds reached the first test at Hyndlee, there were already two black lines showing through the snow covered terrain. Garry Pearson/Dale Bowen in the Fiesta R5 and Peter Taylor/Andrew Roughead in the Fiesta WRC were equal fastest ahead of Subaru mounted Jock Armstrong and Cameron Fair who set the second fastest time ahead of Euan Thorburn and Paul Beaton. Fourth fastest time setters Scott MacBeth and Daniel Forsyth raised a few eyebrows first time on the loose with the new Lancer and they were 2 seconds quicker than Stephen Petch and Michael Wilkinson in the Fiesta WRC. Bruce McCombie’s rally was shortlived. A bottom arm broke and sheared off the hub leaving the Ford Focus WRC stranded on three wheels at the end of the stage. It was quite simply more of the same in the second stage. Once again Pearson and Taylor tied on identical fastest times with Armstrong heading Thorburn, but Taylor was going no further, the Fiesta parked up at the end of the stage with mechanical failure. Stephen Petch was fifth quickest this time after MacBeth burst a brake pipe and dropped nearly a minute getting to the end of the test. 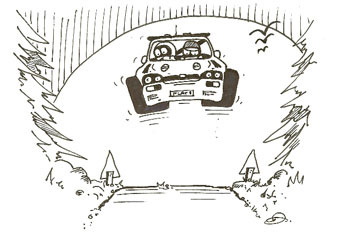 That allowed Michael Binnie and Claire Mole to push their Lancer into the top six times. Not so lucky was John Wink. He got a wheel on the snow under braking for a hairpin. The Hyundai i20 R5 spun and although Wink managed to bring the car to a halt, it just slid helplessly into a ditch under its own weight. Not a mark on the car, but going no further. Chris Collie was another bound for ‘early retirement’. When the fuel pump failed, he switched over to the spare, only for it to fail too, or so he thought. A blocked filter had caused the main pump failure, but since the second pump pushed the fuel through the same line, it was inadvertently blocked too. In worse trouble was David Ross. Not only was the DAM 4100 just as steamed up, his glasses were too: “It was like double glazing condensation,” said David. They weren’t the only ones, many folk had serious trouble with condensation given the amount of water that was falling from the skies and being kicked up by the cars – especially those with holes in the floor, like Donald Peaock’s Peugeot! His shoes and socks were soaked so he dried off, fitted new socks and put his wellies on and finished the rally in his wellies. Given the conditions, the lack of flame resistant footwear wasn’t considered too much of a risk. It was all change in the third test. Thorburn topped the speed rankings in here, 14 seconds up on Armstrong. Only 1 second slower than Armstrong was a quite magnificent Binnie while Ian Baumgart showed he had lost none of his flair and set tongues wagging with fourth quickest in his Subaru. After a cautious start first time out in a newly built Evo8, Freddie Milne was getting on the pace fifth quickest ahead of Petch. That put Thorburn over half a minute in the lead: “I wasn’t too bothered with the snow this morning,” he said, “I just picked what I thought was a safe pace hoping that it would clear during the day and then I could push on.” Which is just what happened and what he did! Sadly, MacDonald’s problems persisted in the third test and he got caught out in the slushy conditions sliding wide on the outside of a bend and down a banking. No real damage but the car was out of sight to other crews. Mark McCulloch got no further than here either after a lack lustre first couple of stages. At the test the previous day, the Fiesta R5 broke a steering arm which pitched it off the road prompting an all nighter to get it fixed for the rally. That must have dented his confidence hence his caution over the early stages but the car slid off in here with Mark again puzzled as to why. Then came the bombshell. Armstrong had suddenly dropped to 8th place. It seems he had incurred a 2 minute time penalty (in company with 9 other crews). Pearson was now up to second place overall. The constant rain caused more problems in here, particularly on one long left hander where the inside of the bend was flooded after the ditch overflowed. Quite a few cars were caught out, particularly the Ross DAM which caught the edge of the puddle and then got sucked into the flood. When it came to rest, all that could be seen was the top of the back window and the roof mounted spoiler. Fortunately, David and Kyle got out OK, but the car looked like an aquarium ornament – all it lacked were some goldfish swimming through it. Next on the scene was Bob Adamson, but spectators waved down the Skoda driver: “Otherwise I’d have been in there with him,” said Bob. Also out, but not quite so dramatically was John Rintoul, when the Skoda’s gearbox failed and the car lost drive. There was no let up at the front, and conditions were improving, although ‘improving’ is a relative term! Thorburn was quickest again but by just 2 seconds from Pearson with Armstrong still boiling along 3rd quickest, one second up on Milne. Petch was 5th quickest and Binnie rounded off the fastest six just pipping Bainbridge by 2 seconds. Going into the final stage, Thorburn still had half a minute on Pearson but could afford to relax, if you can call a one second slower time than Pearson, relaxed. Pearson was quickest in the now ultra-fast conditions but so was Armstrong, the pair of them sharing equal fastest time. Petch was 3rd quickest ahead of Milne who had a 3 second quicker time than Binnie which turned out to be quite decisive. It had secured 4th overall for Milne by 3 seconds from Binnie! Winning the ‘Star Driver’ award was 7th placed Scott MacBeth after a tremendous fightback from his earlier brake loss. He finished just 6 seconds clear of an impressive run from Thomas Gray first time out in his new Mitsubishi. Completing the top ten was the Subaru Impreza of Ian Bainbridge, another to suffer a 2 minute time penalty. Just outside the top ten, Steve Bannister finished top 2WD in a very impressive 11th place overall. “My historic Mk2 doesn’t have the power of these ‘new’ Mk2s,” he said, “that was the difference in these conditions today.” Paddy Munro was second 2WD home with Iain Wilson losing out to Paddy by 2 seconds. All of which leaves Thorburn leading two championships, BTRDA and the Scottish, commenting: “I don’t know what I’ve done to deserve this. Those first two stages today were awful, I was ‘frozen out’ and then after four stages I found myself in the lead. I was miles off the pace in the first two, but I knew we could get time back if it cleaned up, and obviously Garry had his problem so that helped. But who would have believed that after a year out of it?” added Euan.